We are already heading into the Divisional Round of the Playoffs. I apologize for no show last week, but sadly life happened and to be real… a death happened. It’s been a rough start to the New Year. However, I am back with the Divisional Round and giving you all of our picks for this round of the playoffs. I am currently the overall leader, and could lock it up this week if I maintain my lead over Keith. NFL Pick ‘Em Season 6 Week 13 – Bold Strategy Cotton! Week 12 is in the books and I am still in the lead, but it was James who claimed the weekly win this week. My lead currently stands at 3 games. Adam and I talk some games from Week 12 before making our Week 13 picks. The upset picks are massive for some people this week, we will see if their bold strategy pays off. NFL Pick ‘Em Season 6 Week 12 – Happy Thanksgiving Football!! Week 11 was not kind to our picks, even if it did produce the best game in the NFL in years. I (Ray) have taken a 2 game overall lead with my under impressive 7 – 6 week. Tyler and Keith sit tied for second, James is 4th, Adam 5th and OJ’s bold strategy …sadly leaves him in 6th place. Adam and I talk some football and then bring you this week’s picks. So give a listen and play along. NFL Talk Plus Episode 66 – Double The Divisions, Double The Fun? NFL Talk Plus Episode 66! Due to some technical difficulties, we were unable to record last week… but never fear, this week is a double division episode. Keith and I talk about Suspension Tuesday from this past week, as well as a fine handed down to soon-to-be former Panthers owner and a contract extension. Then we break down both the AFC South and the AFC West as we go back to back this week to round out the AFC in our Division by Division series. NFL Talk Plus Episode 56 – Tag Season Has Begun! 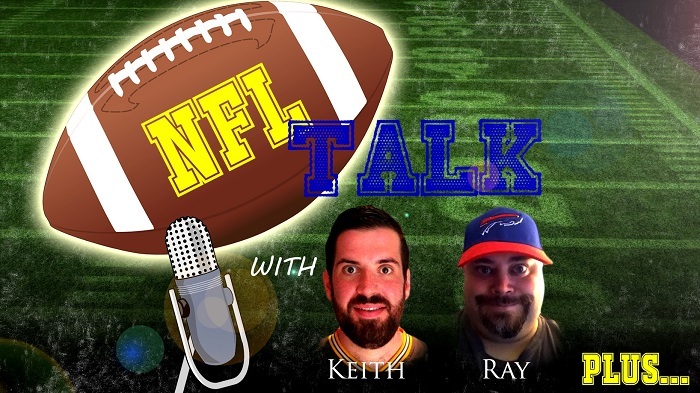 NFL Talk Plus Episode 56! The off season of the NFL is here in full swing and Keith and I sit down this week to discuss some of the news. We have the Colts ACTUAL coach hiring; a massive trade; a few signings and cuts. We even delve into some of the possible free agents. To find out all the things we discuss this week, pop us in your ear holes and find out.